Our classes are informal, so the basic rule is to wear whatever you feel comfortable dancing in. If in doubt, you can always go for smart casual if you're going to a Ballroom, Argentine Tango or Salsa class, but no-one's going to be offended if you turn up in jeans and trainers. For Rock 'n' Roll, a safe bet is tracksuit trousers and a T-shirt. Men should probably avoid wearing shorts. Ladies wearing long skirts or dresses are advised to check that they can stride out fully, while those wearing shorter skirts or dresses might like to try spinning in front of a mirror to check they're not going to show more than they intend. If you're wearing smart trousers, they should be reasonably loose fitting. Ideally, they should reach as close to the floor as possible without tripping you up, as trousers cut too short can look quite awkward when you start moving around and hitting dance positions. Men should be aware that normal formal jackets (suit, dinner jacket or tail coat) will tend to ride up at the shoulders in dance hold, which does not look good. It is therefore common to wear a jacket to an event where the dress code requires it, but remove the jacket while dancing. Jackets made specially for dancing look like they have the same shape, but are cut to avoid the visually awkward 'pyramid' effect. On some occasions, a particular dress code is normally expected. For special events, this is usually indicated on the ticket if you have one. For competitions or semi-formal occasions such as private lessons, there are common standards that you're best to stick with unless you want to stand out. For men, this means smart trousers, shirt and tie. A suit or jacket may be worn, but is not normally required at CDC events with this dress code. For ladies, a mid-length or longer skirt or smart trousers with some sort of smart top would be typical. This is common for afternoon events such as tea dances, and also commonly worn by Modern dancers on semi-formal occasions such as private lessons, practice sessions and workshops. 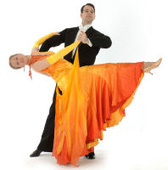 It is also possible to buy special 'practice wear', made for Ballroom or Latin dancing. For the man, practice trousers tend to be a little looser than typical smart trousers. They may or may not have belt loops, and usually have a very clean cut without pockets. Practice shirts are often made of slightly stretchy material, with arms a little longer than normal to accommodate dance hold and often with trunks attached to prevent the shirt coming untucked while dancing. Practice wear may be worn with a tie, and even with a waistcoat for a more formal look. For ladies, practice skirts tend to be around ankle length for Modern and shorter or asymmetric for Latin. Practice tops may have a variety of designs, including asymmetric cuts or drape effects. Practice wear is normally plain coloured with little decoration. It can be worn on semi-formal occasions or to events where a smart dress code is appropriate, and is sometimes allowed in competitions even where full competitive dress is not permitted. For men, this means a dinner jacket (tuxedo) and matching formal trousers, often with silk lapels on the jacket and silk braids down the outside of the trouser leg. The trousers do not have belt loops, but may have an adjustable waist. These are worn with a white dress shirt (usually patterned or pleated, with double cuffs and cufflinks and optionally a wing collar) and a black bow tie. For variety, the man may wear a coloured or patterned bow tie instead, and may also wear either a waistcoat or a cummerbund; it is possible to buy co-ordinated sets. The bow tie may be hand-tied or clip-on. For ladies, the equivalent is an evening gown, traditionally full length but shorter or asymmetric designs are also possible. This may be accompanied by a shawl or similar additions, and is sometimes worn with opera gloves (long evening gloves that reach above the elbow). A cocktail dress or ball gown is an acceptable alternative at CDC black tie events, but trousers or skirt and separate top are normally considered too informal for such occasions (though you might get away with it if it looks really smart). Black tie is the normal dress code for CDC balls and some dinner dances. For more details about competition dress see the DanceSport competitive dress page. In DanceSport Modern where competitive dress is allowed, the man typically wears white tie: a black tail suit (normally with high-waisted trousers supported by braces, because of the cut of the jacket), dress shirt with wing collar and white bow tie, and old-style waistcoat (now normally just an attachment for the front of the trousers to disguise the high waist). It is possible to buy dress shirts made specifically for this purpose, which have a few changes from a typical dress shirt for black tie use, notably including an extra stud at the back of the collar to attach to the tail coat. Ladies wear a full length dress, with a wide variety of lines possible. Popular effects include heavy decoration with stones to catch the light, attaching floats to the arms, using materials that fade from one colour into another, using underskirts in a different colour that flashes during sharp or sweeping movements, and even using feathers on the skirt (if you must!). For DanceSport Latin, again ladies get to wear some stunning outfits, but normally either a short dress or asymmetric design rather than full length. Some ladies prefer a costume based on trousers. In either case, popular effects include heavy stoning, attaching fringes that fly out during spins, and using material with colourful prints. The male Latin competitor will normally wear Latin trousers (similar to practice trousers, but often cut tighter at the top to accentuate the hip action). A man's Latin top can be anything from a plain, black, long-sleeved T-shirt to an open-fronted number with ruffles or even transparent material. Established partnerships may have the man's outfit made to match the lady's dress.